I am a big fan of visiting the Wildwood and Cape May area of New Jersey and we travel down there a few times every year. One of the things we enjoy doing while vacationing there is going out on a charter boat for some great whale and dolphin watching. It is a fantastic experience to get up close to the whales and dolphins as they swim in the Atlantic Ocean. If you are visiting the Cape May New Jersey area...Whale and Dolphin watching is a must! You can find several great companies that run whale and dolphin watching cruises who are affordable. Today I thought I would share with you some of the resources I like to use. A great web site to visit is the Cape May Whale Watcher which sails between Cape May and Atlantic City, New Jersey. They sail March through December and their home port is the Miss Chris Marina Dock in Cape May. Another great web site to visit for information is the Cape May Whale Watch site. 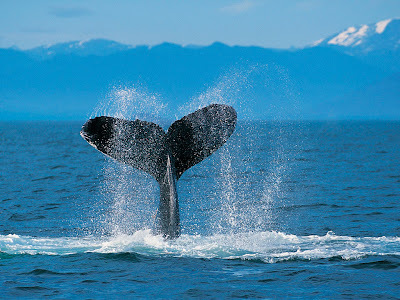 This company has both dolphin and whale watching cruises which are very affordable. You visit their site to learn more and check out their online specials. A great web site to visit for information on lodging, dining, entertainment, rentals, etc. would be the Cape May Times site. You can find links and resources for anything that is related to Cape May, New Jersey. If you have never experienced whale and dolphin watching, I highly recommend it! You have got to experience it at least once and then you will be hooked! It's great to see sea life up close and personal and it's a great relaxing fun time for the entire family.